Swedish trio Movits! made their first trip to the US for an appearance on 'The Colbert Report' in 2009. Now they've completed their first US tour, traveling 8,000 miles and selling out several gigs thanks to their apple stealing jazz--a fusion of swing and hip-hop. Spinner recently spoke with saxophone player Joakim Nilsson via phone from Sweden about their next whirlwind adventure in the USA, five gigs in Austin, Texas at SXSW. Johan, the singer, and Anders, the producer/DJ, are brothers, and they started playing acoustic-based hip-hop with just guitar and vocals back in 2002. I met these guys around 2003 or 2004 and I started playing the saxophone with them. We formed Movits! in 2005 because our musical direction had changed. We found our style of music pretty much at an after party when we were dancing to "Sing, Sing, Sing" by Benny Goodman and we thought, "Why isn't anybody who's doing hip-hop, doing this kind of hip-hop?" That's when we thought, "Okay, we need a new name, this is something else than we were doing before." It's hip-hop music mixed up with a lot of genres especially swing music. There's a little bit of gypsy Balkan music and jango. Mostly it's swing music-based hip-hop. Benny Goodman type of swing is a big influence. There's a Swedish rapper called Timbuktu. He's an influence because he's uses a lot of organic and real instruments in his music. Outkast, André. In Johan's way of writing his lyrics, old folk singers from Sweden, especially Cornelis Vreeswijk is a big influence. The band name comes from Cornelis and even older folk music artists from Sweden like Michael Bellman. He sings about this Fader Movitz who is an old fiddle player and he's a character in a lot of these old folk music songs. It's actually spelled with a Z on the end but there's a lot of really tacky Swedish dansbands [dance bands] that write their names with Z's instead of S's so chose to use the S.
I know the name of the album (Äppelknyckarjazz) roughly translates to "Apple Stealing Jazz." Where did that title come from? There were street kids back in the '30s or '40s in Sweden and they had these apple stealing pants. These were street kids stealing apples and having fun. Our music is kind of flirting with the '30s, '40s, '50 swing music. You just finished your first US tour, how did that go? It was way above our expectations. We didn't know what to hope. We knew that we were on The Colbert Report and there was some big buzz when we did that, but we didn't know how many people would still remember that. We sold out six places out of fifteen. Can you share some stories from the road? It was a long, long drive. It was 8,000 miles in an RV with seven guys. There were flat tires, power generators that broke down. We ran out of propane around Minneapolis where it was hella cold so we had to find after parties where we could actually sleep and not freeze to death. It was too cold to sleep in the RV. Now you're playing a few gigs in Sweden before heading back to SXSW. What's in your festival survival kit? A lot of water. Good shoes. We're playing pretty much every day we're at SXSW, so we'll just try to keep the momentum going. You speak perfect English, but all your songs are in Swedish. Can you give me a flavor of what your songs are about? A lot of the songs are about social matters, about being an outsider [like "Fel Del Av Garden"]. A lot of the lyrics focus on injustices and "Äppelknyckarjazz," the title track, is about "Why are you complaining about me stealing apples when there are big companies doing worse stuff?" But it's all written in a way that is not obvious, up in your face trying to condemn stuff but written in a way so you can listen to it and think "This is a cool story," and actually get a message too. Do you have any plans to record or perform in English? No. Right now we're sticking with Swedish but when we play live we try to incorporate some English. We have a couple of new songs that we sing a chorus in English. We do understand that it's not that common to go tour and play in the States if you don't sing in English. I actually like the sound of a couple of Britney Spears songs and that's a big no no... especially the ones produced by Bloodshy & Avant, Swedish producer duo. Who was your first celeb crush? Sweden has a lengthy tradition of pumping out hot, catchy pop groups and rock stars. Who's next? I'm really excited about a hip-hop band called Maskinen, which translates to The Machine. 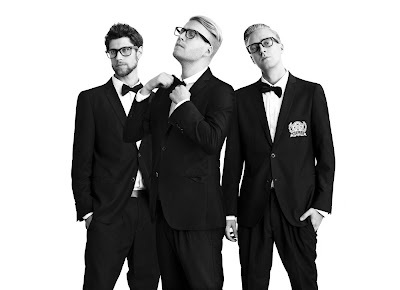 They sing in Swedish too and they make some kind of electro-based hip-hop. Robyn is coming out with a new album that's probably gonna be very huge. And the guy that came with us on the tour, Zacke just put out his record here in Sweden. Before your appearance on The Colbert Report in July 2009, did you actually know who he was? Yeah, I had watched quite a lot of The Daily Show and I knew about him. We had no idea that he was as big as he actually was. We thought that his show was really under the radar. We realized that it was kinda big for them to actually ask us but we thought it was some really underground show, way smaller than The Daily Show. It's kinda good that we actually thought that until we saw our show on TV 'cause I think we wouldn't have been able to play if we knew it was that big. Have you heard about the phenomena called "The Colbert Bump" (an increase in popularity as a result of being a guest on the show)? Do you feel like you experienced this in the US since your TV performance? We had an import record in the States and the day after we played on the show the record sale had gone up 85,000%. [Laughs] Yeah, it was like in place 90,000 the day before the show and the day after it was #72 on Amazon. And we went up to #2 on the iTunes hip-hop charts above Kanye and Eminem. We had heard about "The Colbert Bump" but this was more like The Colbert Earthquake. Read this article on Spinner.